On the Xbox One side, both The Incredible Adventures of Van Helsing III and Zombi are not exactly what you’d call smash hits. With Open Critic ratings in the mid 60s, these are kind of 0erfect games to get for free. At a glance both look to be similar in tone, but Zombi is all about first-person survival/horror and Van Helsing III is more of a Diablo- esque hack and slasher. Van Helsing III offers a bit more depth than Zombi, and the main issue fans seemed to have with the game is that it wasn’t as good as the other installments. So, if you’ve never experienced Neocores’ Van Helsing series this might get you started, and if you dig it there’s a couple (better) games to check out. 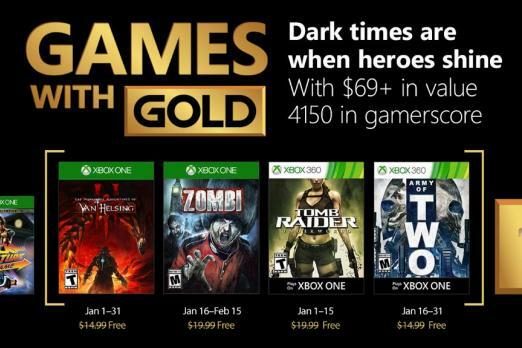 For your free Xbox 360 Games with Gold January 2018 offers you a much more solid pair (yes it’s a Tomb Raider joke and no I won’t grow up) in Tomb Raider: Underworld and Army Of Two. For fans of old-school Lara Croft, Tomb Raider: Underworld is the final installment in the Legend trilogy and more-or-less her last appearance as the top-heavy pop culture icon gamers recognize. It’s not all eye-candy though, Tomb Raider: Underworld packs serious platforming and puzzles too, so if that’s your jam you’ll find plenty to enjoy. If an action-driven game is more your thing then Army of Two won’t disappoint. Best experienced as a couch co-op game, invite a friend over and enjoy. It’s got cool masks and cool guns and some superb shootout sequences. If you’re interested in downloading these games your Xbox One is probably already coming into your bedroom at night to wake you up and slam notifications in your face about Games with Gold, so just turn the thing on and figure it out. It’s easy. What do you think about the January 2018 Games with Gold list? Is Zombi some sort of hidden genre gem I don’t know about? Let us know in the comments!